Released in 2007 by UK-based Strictly Ink, this 72-card (base) set features screenshots and behind-the-scenes photos from a wide selection of Hammer’ catalogue of films, as well as factoids on the stars of those films. As would be expected, Hammer icons Christopher Lee and Peter Cushing get the spotlight, with each actor receiving a 9 card run devoted solely to their respective careers. Each of these 9 cards have backing images with can be pieced together to form mini-posters of these legendary horror actors. While this series was available for purchase as a complete set, as with most modern trading cards, the rarer “chase cards” are only available through the individual 5-card retail packs. In this case, those “chase” cards include 20 various sketch cards, 10 autographed cards, and a 9-card series of gold-foil cards featuring the original poster art for some of Hammer’s films. These posters cards made it to print late and were included in separate packs. There was also an case-exclusive autograph from Jenny Hanley (Scars of Dracula), as well as an additional Ingrid Pitt autographed card that was exclusive to a binder that Strictly Ink made for the series. As noted earlier, among the “chase” cards are 20 different sketch cards. The cards feature artist’s sketches of characters and scenes from Hammer’s entire horror library. The sketch cards also feature autographs from the artist on the back. While there are some nice pieces here, just as many are hideously amateurish. Cards #1-#9: Early Science Fiction Thrills – featuring the Quatermass series, The Abominable Snowman, and a few more. #55-#63: Hammer Glamour – Featuring more lovely ladies of Hammer, including Raquel Welch, Jacqueline Pierce, Caroline Munro, Ursula Andress, and the Collinson sisters. #64-#70: Behind The Screams – Behind the scenes looks at some Hammer’s films, including Twins of Evil, Plague of the Zombies, and more. Complete sets can be found online for around $20, but as mentioned earlier, “chase” cards were only available through retail packs. Retail pack can be found online in the $2-$3 range. For the purpose of this review, as well as just wanting the damn things, I purchased a much more expensive sealed box of 30 packs. With 5 cards per pack, this would be a total of 150 cards. Sealed pack boxes were extremely difficult to find, with only 2 for sale being available to me. These were available from UK dealers at prices ranging from $50 – $70. Per the display box, the odds of finding an autograph card are 1 in 30 packs. That means that each sealed box of packs should contain at least 1 autograph. 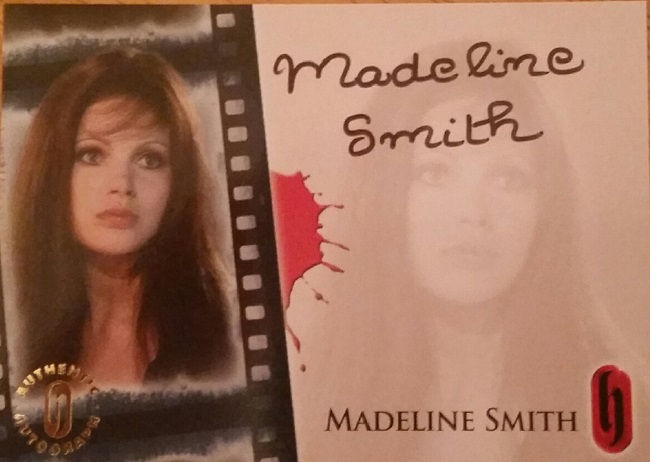 In this area, I was not disappointed as I did find an autographed card from the lovely Madeline Smith. While I personally would have preferred Caroline Munro or the late Ingrid Pitt, I am far from disappointed with this find. Odds of pulling a Sketch Card are 1 in 120 packs, making them significantly more rare, but nowhere near as exciting. I did manage to pull 1 sketch card out of this box, and honestly, I don’t hate it. 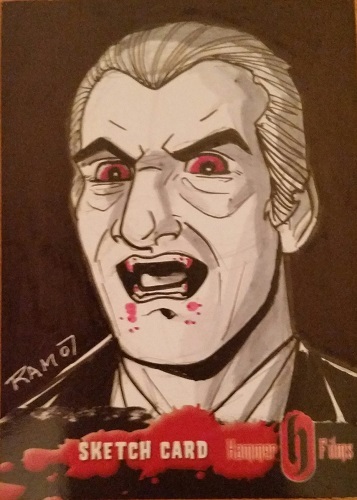 Personally, I think it looks more like a vampiric Bill Hinzman than Christopher Lee, but hey, art is subjective or something. Of particular note is the following sentence found on the side of the pack box: Strictly Ink Guarantees (they capitalized it, not me) that each sealed numbered box of 30 packs contains at least one complete basic set of Collector Cards #1-72. To this, I say: You lying’ bastards!!!! I opened every single pack in the box and I’m totally missing card #21!!! While it was somewhat of a disappointment to be 1 card short of a full set, these are nice looking cards featuring sharp, glossy pics, as well as trivia on these classic Hammer films. While somewhat over-priced, these cards quality and scarcity make the set a nice addition to any horror fan’s collection. With my purchase, I was also able to obtain a pack of the poster cards as well as a promo card. These made the purchase price a little more palatable. A second series was released in 2010. These can be obtained at marginally cheaper prices, however, I personally found the autographs available for that set to be less desirable. Fantastic, I assume I can find some of these on ebay. That was about the only place I could find them. Last that I checked, the same seller I purchased from was the only one to have them. The price had come down around $5. I collect anything that is assocaited with Peter Cushing and Christopher lee from CDs, Records, Photos etc signed or not signed as now they are getting very hard to find and getting more rarer and that makes them more desirable and up goes the prices eg i bought a signed photo of Christopher in his Dracula outfit B/W and paid 80.00 pounds for it 1 year ago now its 250.00 pounds and very very rare to get.I am going to give them to my son when i leave this planet.